When the latest BLS jobs report was released Friday, one of the interesting trends that Catherine Rampell picked up on regarded self-employment. Among workers who reported being self-employed, Rampell noted the percentage has mostly gone down — not up as most would assume with the weak labor market. 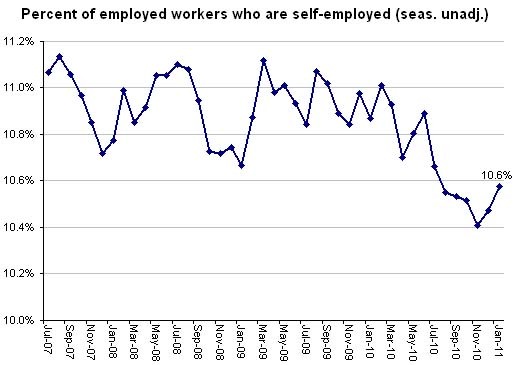 Here’s the chart she used in her Economix post, showing just over 11% were self-employed in June 2007, compared to 10.6% last month. This data comes from the Current Population Survey, conducted by the Census Bureau for the BLS. With Analyst, we’re able to look at similar breakdowns in the makeup of the workforce using a wide variety of federal and state sources. Analyst gives users the ability to toggle between two main datasets — EMSI Complete and EMSI Covered. By comparing total employment numbers in the datasets, users can get a sense of the composition of specific industries or their region’s overall workforce. EMSI Covered lines up, with a few exceptions, to state labor market information. About those exceptions: We unsuppress non-disclosed data, distribute jobs coded at the state level to individual counties, and put all government employment, regardless of industry, into separate categories based on total figures from the Bureau of Economic Analysis. Bottom line: According to EMSI Data, the percentage of self-employed workers and others not covered by QCEW (such as farm workers and sales agents on commission) has increased slightly, from 22.3% to 23.5%, in the last four years. This uptick goes against what the BLS data shows, but it makes sense if you consider EMSI adds workers from various other industries that are seeing increases in the number and percentage of independent contract workers. By adding in non-covered workers, EMSI Data gives a more complete look at the workforce. Interested in seeing this breakdown for your region? Email Rob Sentz or, for existing Analyst users, contact your regional customer service rep.